On a spring day in May 1977, a movie opened that would capture the hearts of audiences across America. It would soon fill movie screens and drive-ins and become one of the biggest movies of the year. Smokey and the Bandit gave moviegoers an hour and 36 minutes of mayhem, tomfoolery, and just plain fun. When you saw the preview on TV for the first time, you couldn’t wait to get to the box office, reach into your pocket, and pull out $2.25 for admission. And admit it, when the Bandit drove that Starlight Black Trans Am out of the back of that 18-wheeler, you know you wanted one. Let’s travel back in time when the CB radio was the social media of the day and your handle was your screen name. By now, if you’re a fan of the show, you probably know all about the story. The Bandit and Snowman have to travel to Texarkana, Texas and back to Atlanta, Georgia in 28 hours with 400 cases of Coors beer. But do you know all the interesting places where the movie was filmed? Here’s a hint: most of the movie was filmed in the metro Atlanta area. Join us as we take you on a 40-year now and then look back at many of the Smokey and the Bandit filming locations. During the opening of the movie, Big and Little Enos Burdette approach the Bandit with a proposition. Drive to Texarkana, Texas, pick up 400 cases of Coors beer, and be back in 28 hours. In the background lies a Spanish colonial-style building on the adjacent fairgrounds. Today, this building is part of Screen Gems movie studios. The top of the one-time exhibition hall is visible just over the tree tops. The Bandit knows he needs a partner to help him get the beer back in time. And he knows the Snowman is the man for the job. Originally the Snowman said no but after being offered part of the $80,000 payout, he wastes no time getting ready and joining the Bandit. Today, the house where they started their journey is long gone. In its place are government buildings belonging to the city of Jonesboro, Georgia. Once the Snowman is on board, the clock starts and the Bandit and Snowman hit the road headed to Texarkana. The Bandit takes the lead and does a burnout in the street as he leaves in his black Trans Am. Today, the burnout marks are gone but the street where the Bandit laid rubber is still there. Not much appears to have changed on North Street in all these years. It looks pretty much the same as the day when the Bandit and Snowman started their 28-hour run to Texarkana. The Snowman’s home might be gone but the house across the street is still there. This is the same house in the scene where the Bandit does his burnout as he starts the trip to Texarkana. The once white house is now painted in red, white, and blue. That’s somewhat fitting for a home featured in a piece of cinematic Americana. Remember the Bandit’s first car chase with the law? The one where he turns a sharp left at the intersection, jumps the curb, and hides behind a small brick building. The brick building may be gone but several of the other buildings are still there. For instance, the bank on the corner is now a pawn shop. The building across the street is now PJ’s Cafe. Visually, not much has changed here and the town square also looks much the same as it did during the car chase. The brick building the Bandit hides behind is long gone. The space is empty now near the corner of Macon Street and Highway 20/81. However, the oak tree behind the Bandit’s Trans Am is still there. After 40 years, it’s still providing shade to folks that visit the town square. The Bandit and Snowman finally arrive in Texarkana. Actually, they’ve never left the state of Georgia. Here, they can be seen passing the train depot on the corner of Main and Mill Street. Aside from having different signage, the old depot looks about the same. Wayne’s looks a little different after four decades. Today, it’s a coffee café on Main Street. If it were open when the Bandit and Snowman came to town, it probably would have been a great place to grab a hot cup of joe and some breakfast before heading back to Atlanta. The Bandit and Snowman get to Texarkana so early, the town looks almost deserted. The same could be said for the day we visited. Main Street still retains its small town look and charm. The Bandit and Snowman reach their final destination. It’s now time to load up 400 cases of Coors beer. Today, the beer warehouse is totally unrecognizable. In its place is now the Arts Clayton Gallery. We researched a bit on the art gallery but couldn’t find any information on when it was built. The Bandit and his Trans Am are on their way back to Atlanta when they come across a damsel in distress. What they find is a runaway bride (Sally Field) with a broken down Chevrolet Impala. What appears to be a two-lane highway is actually a rural road through the outskirts of town. Even today, this road hasn’t changed much and still retains much of its rustic charm. As the Bandit takes off with Frog (the runaway bride), several strange figures in a Dodge Tradesman van pull up to the highway. They’re up to no good and looking to get into trouble. They see Frog’s abandoned Chevy and pull over to try and steal parts from the car. Little do they know they will soon be greeted by the notorious Sheriff Buford T. Justice. Arkansas Sheriff Branford has high hopes of catching the Bandit. He and his misfit posse of deputies have been scheming on just how to catch him. Over the sheriff’s right shoulder is a sign advertising homes for sale in a subdivision being built. Today, Willow Bend subdivision is still there, a footnote in the history of Smokey and the Bandit. The Bandit decides against playing chicken with the Arkansas Sheriff’s Department and makes a U-turn to drive the other way. The sheriff and his deputies give chase and the mayhem ensues. This area has gone through quite a bit of development and looks little like it did when the movie was filmed. 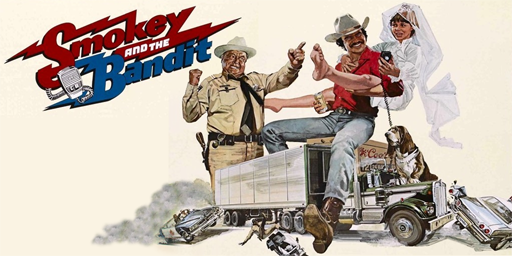 During the chase with Sheriff Branford, the Bandit comes upon a dead end in the road. Seems the bridge is out over a local river. He turns around and tries to run through the sheriff’s blockade but realizes he cannot. From there, he has two choices. He can either give up or try to jump over the river. Since he’s the Bandit, you know he’s going to try and jump over the river. Not much is left of the old bridge today. Only a few pilings are now visible in the Flint River. According to the local fire department, most of the old bridge burned in the early 1990s. Not long after jumping over the river, the Bandit drops Frog off at a local bus stop and restaurant. While he’s there, he orders eats for himself and the Snowman. While the Bandit is waiting at the counter, Sheriff Justice walks up and orders a Diablo Sandwich and a Dr. Pepper. Fortunately for the Bandit, the sheriff doesn’t recognize his voice and strikes up a conversation. When Sheriff Justice excuses himself to go to the restroom, the Bandit makes his getaway. The Old Hickory House restaurant is long gone. In its place is an empty gravel lot with little sign of any new construction in the near future. Sheriff Justice is in hot pursuit of the Bandit. During the chase, a truck carrying a long, steel beam crosses path with the sheriff’s patrol car and there’s no time to stop. The top of the car is cut off and the sheriff narrowly escapes being decapitated. This area also looks much the same as it did 40 years ago. When the Bandit and Snowman stop and meet up on the way back to Atlanta, the Snowman’s dog (Fred) escapes and jumps in a lake on the side of the road. Since Fred doesn’t want to get out of the lake, the Snowman has to go in after him. The lake and the adjacent house are still there. The only thing in the lake on the day we arrived was a few ducks. Here we see Snowman out on the highway headed back to Atlanta. He’s nearing his destination and only has a few hours to go. However, he still has to keep eye out for Sheriff Justice and all the other smokeys out to get him and the Bandit. It’s time for the Snowman to fuel up the Kenworth and get some grub for himself. He stops at one of his favorite dives on the way back to Atlanta. However, he encounters a mean biker gang and gets beat up while waiting for his food. Not much today is recognizable of the old truck stop and restaurant. Any businesses there have closed a long time ago and the building has been abandoned. The concrete base where the old gas pumps once stood is about the only evidence that a gas station was ever at this location. Remember the grandstand filled with spectators watching the 18-wheeler truck races? They’re hardly recognizable today because they’re hidden behind a grove of trees and can barely be seen. After the race track closed, the grandstands fell into disrepair and have practically crumbled over the years. Today, the only cheers these grandstands hear are those coming from the local amphitheater. Photo location: former Lakewood Fairgrounds, Atlanta, Georgia. After taking on the bet to drive to Boston and pick up some clam chowder, the Bandit, Frog, and the Snowman make their way out of the fairgrounds. This time around, they’re making the trip in Big Enos’ Cadillac. Sheriff Justice gives chase and the movie ends. This scene also took place at the old grandstand. The edge of the grandstand is barely peeking through the trees in this modern-day photo. Smokey and the Bandit was the second highest grossing movie for 1977. It lost the number one title to Star Wars. It spawned a couple sequels and a television show but none were as popular as the original. Today, there are multi-state cruises such as the Bandit Run and festivals in towns where the movie was filmed that still keep the memory of the movie alive. If you’re ever in the south Atlanta area, it’s worth spending the day exploring filming locations of the movie. Most are easy to find and we hope this article serves as inspiration to get out and see them yourself. Just watch out for a guy in a black Trans Am trying to outrun the law. He might be followed by a truck driver in a black and gold Kenworth. Both are probably up to no good but harmless otherwise. Diane Green – thank you for taking time out of your Sunday morning to take our managing editor to almost all the locations that needed photographing. You are the best! Clayton County Fire Department Station Number 12 – thanks for sharing stories with us about the movie and helping us find some of the locations we had trouble locating. Actually, the house was located at 114 North Avenue, not North Street. It was our house and my sister is the one who opens the truck door for Burt Reynolds. Thanks for the message. We corrected the street name to Avenue. Also, thank you for the info on your sister. I bet most people don’t realize she was a kid from across the street during the time the movie was filmed. Imagine how I reminisced! Our 1953 JHS Senior Superlative pictures were made in the house with the lake. I’ve been a trucker for almost 30 yrs and this is my favorite movie of all time. I grew up watching Smokey and the Bandit and I could watch this movie every single day cause I just can’t get enough of it. They just don’t make movies like this anymore. God bless the Snowman and Bandit. Do you know where the location of where the first traffic light location after they leave Cledu’s house?? Also the name of this highway and cross street name and the town this location is in so I can find it on Google maps. Also the area where the Old Hickory House Restaurant stood and the name of the Baby Beef Burger Place was located at and the name of the truck stop they used in Duluth??? I know the location is now a Best Buy and the location where the Bandit goes by Wallpaper House,Inc. store location and the Gerdks store near the Wallpaper House store. Can anyone out there is Georgia that can help with this????!!!!! I can help you with the location of the “old hickory house” restaurant in Forest Park. Here is the approximate address of the vacant lot where it wince stood. What about some of the scenes shot up above Helen on 75 north? where is the bridge where they kiss in the woods? Does anyone have a location for where The Bandit and Frog were 10-10 on the side in the woods, kissing on the bridge? The mountainous scene you are speaking of was coming off of Unicoi Mtn into Helen, Ga. I recognized the rock shop. That’s where the creek scene is also. Not Athens, GA. Helena!! Yes! Lol. Thank you for correcting me! Hi Cheryl, This is Allison Porter. My Mom was your Mom’s 1st cousin Virginia Betsill.. Hope all is well with you and your family. This film will remain ever beloved. I will sometimes run Smokey and the Bandit as a surrogate person in the room when I’m home by myself; it’s great company. In addition to the sheer fun of it, this movie was the only film that gave Star Wars a run for its money in ’77. Also notable for a Trans Am of course which had also featured in a film, Thunderbolt and Lightfoot (1974), a few years earlier. Naturally, and because I was just 21 when Smokey and the Bandit was released, my young and thoughtful wife would not allow me to get a Trans Am! Oh, she was so right in that. Still, for years I’d see Trans Ams everywhere as their popularity surged after the success of the first movie. With Burt Reynolds’ passing late last year this timeless film takes-on dimensions which are even more mythic. Now it will no longer be possible for another Smokey and the Bandit film to be made again. Thank goodness that Sally Field and Paul Williams still carry-on as living links to the original production of this movie.